Microsoft Surface Go review: a new iPad Pro and Galaxy Tab S4 killer? In the land of the pro tablet, the iPad Pro is king. Well, okay, maybe that depends on whether you count the likes of Microsoft Surface Pro as ‘tablet’ or ‘touchscreen PC with optional keyboard’, but if we’re talking 10-inch traditional tablet form factor, Apple’s had it fairly well sewn up. Microsoft’s here to have its say about that, though, with the new 10-inch Surface Go. It runs Windows 10 S, which limits the apps you can install to just those from the Windows Store, but you can choose to upgrade to regular Windows 10 Home, and basically just have a standard PC. Best 2-in-1 laptops: which Windows 10 laptop-tablet hybrid is right for you? The lightweight Intel processor inside is enough for it be a real PC in a form factor that more closely matches the iPad, so do we have the best of both here? Light and portable, but without the limitations of Android (or iOS, in the case of the Samsung Galaxy Tab S4, which is also big competitor here)? Starting at £379, more like the lower-price 9.7-inch iPad, the Surface Go aims to be a tablet for all budgets. For that, you get an Intel 4415Y 1.6GHz processor, 4GB or RAM, and 64GB of storage. The 10-inch screen has a resolution of 1800x1200. However, the type of storage used in that model is very slow, simple flash. We don’t really recommend it, for speed reasons we’ll come to in the review later. The model we tested was the £509 model, which is identical except that you get 8GB of RAM, and 128GB of much faster storage. For the price, you just get the tablet itself. The Surface Go Signature Type Cover (which adds a keyboard and trackpad in a magnetic cover) starts from £99, while the Surface Pen that lets you draw on the tablet costs another £99. The Surface Go’s 10-inch 1800x1200 LCD screen is an unusual 3:2 shape, which is great for side-by-side documents, but less ideal for wide video. It’s bright and clear enough, but we were testing it at the same time as the Samsung Galaxy Tab S4, and there’s no competition between them, really: they’re about the same brightness, but the dynamic range of the Tab S4’s OLED screen puts the LCD here to shame. Not only that, but the 2560x1600 resolution of the Tab S4 is much sharper than the Surface Go. The iPad Pro’s 2224x1668 is also clearer than the Surface Go, and has a beautiful wide colour display that’s more vibrant. It doesn’t help that the Surface Go itself looks more like the first-generation iPad than the current models – wide bezels and a thick silver body leave it feeling way behind the ultra-thin build of the competition, though the build quality is excellent. The speakers are Dolby-tuned, and are loud and clear, though this is par for the course with other tablets at this price. We are in love with the stand Microsoft has put on the back on the Surface Go. It’s useful to have there in any case, but it’s especially well-executed. It folds open almost 180 degrees, which means you can lay the tablet almost flat (a good angle for drawing or typing on-screen), but the flexibility also makes it good for laps and trains, both of which tend to need awkward angles very different to what you might need on a desk. Compared to the limited angle of using the iPad Pro with Apple’s Smart Keyboard Cover, it’s a vastly superior system. 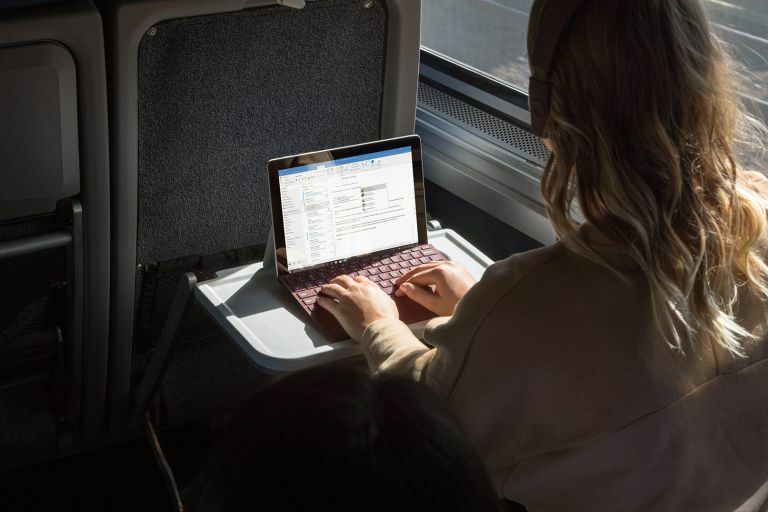 The feather in the Surface Go’s cap is obviously its use of Windows. When it comes to the flexibility of what you can do, the Galaxy Tab S4 and iPad simply can’t match it. Though it comes with the locked down 10 S version of Windows, the fact that you can switch to the full version for free is a huge draw. No matter how esoteric the software you use, now you can use it anywhere, in a machine that weighs a smidge over 500g. Fantastic. Obviously, there’s not a lot of power on tap here, so you’ll need to reign in exactly what you try to use on it, but it’s capable of a lot. Benchmarks say that it’s actually less powerful than the iPad Pro for raw chip potential, but what you do with that speed is at least as important as the speed itself. Having said that, Windows’ performance here in general is a bit up and down. Apps feel slow to launch compared to the slickness of other tablets, though most are totally smooth to use once they’re open. And, bear in mind, we’re saying things feel slow to launch on the model that has faster storage access – that’s why we’re not keen on the slower one. Windows does tend to stutter a little in other areas, but overall it feels fast enough to use, and didn’t have any problems with multitasking. The real issue for us is that Windows has bit of a Jekyll and Hyde deal going on with touchscreen. There are touch-friendly apps, sure, but even the likes of Edge seem made for a bigger screen. There are things that work great, such as being able to drag windows around and snap them to a portion of the screen… but then you have something like File Explorer, which opens to a very small and fiddly view. It has the more touch-friendly icons mode, but the button to switch between them is the smallest toggle of all! There are other little areas of polish that we’re surprised Microsoft hasn’t locked down yet: the Camera app has to be dug out of a list of apps, for example, and pinned to the Start menu, if you want it readily accessible, but it should be there by default, instead of random suggestions from the Store. Similarly, there’s no easy and obvious shortcut to adjust the screen brightness, but we found ourselves wanting one several times. The good news for artists and note-takers is that the performance of he Surface Pen on the Go was impeccable. Responsiveness felt instant, and lines appeared smoothly as we sketched – there was no lag at all, which can be a killer for a drawing device. Also excellent is the Signature Type Cover. The keys are a great size, with great feedback and a good amount of travel. We were perfectly accurate typing on it. Well, as accurate as we ever are, at least. It also has a generously sized trackpad that works great, and helps to avoid some of the problems with Windows not being especially touch-friendly. Things are still quite small on its 10-inch screen, but the precision element is no longer an issue. There will be people for whom this is tablet nirvana, an oasis in the desert of iOS and Android tablets that they find too phone-like, and not computer-like enough. But if you tried those and found their focused nature to be a positive, the unkempt nature of Windows borders on unpolished. There is no doubt that an iPad or Samsung Galaxy Tab S4 is a slicker, smooth experience overall… but they don’t have the flexibility of Windows. Really, we only think you choose this over the competition if Windows is that important to you, but it’s important that Microsoft didn’t rest on those laurels. With a fantastic pen and keyboard for input, and brilliant ergonomics from its stand, it doesn’t feel like a compromise. This is a very good pro tablet. Which should be your next computer?